Total of 6 units, Front house has 4 units, rear building has 2 units. 13 total bedrooms. Property is being sold in "As is Condition. One unit needs to be remolded. Need 24 hour notice to show. 2 vacant units currently. Union Endicott High School High School / Public 6 0.32 mi. All Saints School * Pre-School, Elementary School / Private N/A 0.11 mi. Clayton Avenue Elementary School * Elementary School / Public 7 1.17 mi. Linnaeus W West School * Elementary School, Middle School, High School / Public N/A 1.31 mi. Jennie F Snapp Middle School * Middle School / Public 5 0.61 mi. Vestal Senior High School * High School / Public 8 1.23 mi. 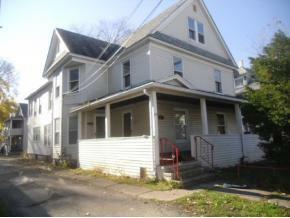 1104 Monroe St, Endicott, NY 13760 multi-family home was sold for $45,000.